← Yelp-ing: How and for Whom? I felt pretty down and out. For awhile. I didn’t know exactly what it was. I thought I had identified the problem(s) as well as a number of solutions. But I didn’t realize that the problem(s) and solution(s) ultimately resided in myself. I knew I needed a change. I first started to “see someone” in June. Yes, I was in a relationship at the time. But this new relationship was not to run from my relationship with my love, but to find my way back to her. I was having trouble finding my way on my own. So after battling with myself for much longer than I realized (something I came to understand only over time), June was when I first started to see a therapist. Though I knew this before, I never fully appreciated how many of the challenges in our relationships with others are often rooted in the challenges we have with – and within – ourselves. See, it’s easy to tell stories. Stories that we believe ourselves and tell to others. But sometimes those stories we tell others are the path by which we run away. Our energy is driven by fear, not love. And even those closest to us have a tough time seeing that. They only want the best for us – they listen to us, comfort us, console us, and hope that we will feel better. But how many of them realize when there is something deeper lurking underneath? And even when they do, can they be impartial to help us sort things out? We all have our own stuff we’re sorting out. We have our own histories and experiences, even if we have grown up in the same home(s), gone to the same school(s), worked at the same job(s), or have spent social time together. Each of us are unique, our own selves. We don’t always come in pretty packages. We carry around various amounts of baggage in various forms. It’s not until we’re able to spend a focused amount of time, over an extended period of time, with someone who is trained to be impartial, that we have a chance of finding someone to talk to that will not project their own feelings and biases on us and our situation. What I didn’t realize about therapy is that it isn’t about anything or anyone else as much as it is about ourselves. Did you know there are therapists who won’t keep photos of any kind in their office? Even things like photos can serve as distractions to those who come to the office already distracted by far too much input. Because when we’re dealing with me, myself, and I, it can already be confusing enough. We think or feel this way and that way. Then we add in all the feedback from others. This person’s opinion, that person’s opinion, and other peoples opinions. And the thing is, they all have good intentions. But since there is so much noise. It can be confusing. But what do we think – deep down inside? And how do we navigate through the noise and find these thoughts in places that can be so lovely, yet so dark, and deep? Writing was my compass on my journey to find the light at the end of the tunnel. But, it was a process. I didn’t fully realize I had been depressed until this past November. And I’d like to give some credit to the month of Movember. The moustache truly is an incredible catalyst to bring about change and give men the opportunity and confidence to learn and talk about their health and take action when needed. We can trace early efforts to improve myself as far back as Fall 2013. That said, my intellectual promiscuity was also close to its peak. That was a phase. And in its wake, change was slow-going. I did make some progress in the winter and spring that followed. And this past summer changes were more significant. Though the real turning points didn’t start to emerge until I chose to “see someone.” Regularly. Because you can recover from most things if you choose to focus on it, to face it, to work through it. I spent so much time talking and thinking about it, but was never truly focused. I created space, filled it up with other people and things and “projects” and neglected to focus on what was most important. The way I went about it was just my form of running away. I had convinced myself I was working on it, but I was just waiting. And in the meantime, I couldn’t express myself, I couldn’t focus on anything else, get much of anything done, make decisions, see much of any future beyond what was in front of me, and I alternated between waking up way early or not being able to pull myself out of bed. That had never happened to me before. I rationalized it all as me being able to see the problem(s). But the biggest problem was that I couldn’t see or prioritize the right problems. These days, I realize that during that time I was blind. I’m so happy that I can see again. And this time, what I see is a present and a future that is brighter and full of more texture than ever before. You see, depression is all about love, actually. It’s about forgetting – or neglecting – to love ourselves. Many of us know from experience that love can be painful. Not loving yourself can result in the greatest pain of all. And loving yourself? Can result in the greatest love of all. Some people who know me may just see great energy. Some who know me better see elements of the old plus some new or improved elements in a better me today. People have told me about things over these past few years that I did and said that I don’t remember or recognize. And there are quite a number of other things that I absolutely do remember and am not proud to admit. Again, let’s come back to the idea that in depression we can’t love ourselves – or others – fully. On my road back to love, I have needed to own my feelings of inadequacy, to recognize all the running I was doing, and to reconcile and be willing to understand, consider, and face doubt. Doubt in both myself and the doubt that would come from others. These are things that I needed to own, have taken steps to own, and own today in order to move beyond where I was to who I am. Once you start to move beyond the depression, you start to embrace parts of yourself that you haven’t embraced before, or perhaps just a long time. And things are different. Sometimes even the people that love you most can have the hardest time realizing and accepting that you’ve changed, even when that’s what they were always hoping for. We find solutions to our problems when we seek to understand, choose to accept, and find the confidence to accommodate. Embracing a solutions-oriented approach takes great courage. It is one of the highest form of love. I write this post not so whomever reads it will feel sorry for me or what happened. This isn’t a sob story, but a story of hope. It’s me being honest with myself as much as I’m being honest with you. Mental illness has such a terrible stigma. And you hear stuff like that all the time. There are a lot of things out there that are stigmatized. But I can speak about this one from personal experience. Though I can only speak about it like this now, with this kind of confidence, because I have been honest with myself and others about my depression. And I have chosen to embrace love over fear. I used to be afraid of being judged. But now I realize those who judge me for the problems of my past may still be grappling with their own problems, which may not be past. I hope we can continue to find kindness in our hearts and to be kind to each other. But either way, for those who will judge me, I will forgive them. And if that’s you, I forgive you too. Please make no mistake. Depression can happen to any of us. Though not every problem is because of depression. And I’m not suggesting that we’re all depressed, we’re not. But whatever is keeping us down, we can’t hide from it. We sometimes must open ourselves to the things that hurt us most, in order to move beyond. And we must be honest with ourselves and with others. There are things we may be dealing with that we and the others who care about us most are unable to see or are not equipped to be impartial. To listen to you, about you, only. Some people are trained for this. That’s why they have initials like MD or PhD at the end of their name. The rest of us just think we’re experts. We have feelings, don’t we? Well we must be in a good position to give others advice on their complex thoughts and feelings given we’ve had plenty of complex thoughts and feelings ourselves. It does take time and it does take work to move beyond where we are, wherever and whatever that may be. It takes time talking to others, but specifically talking with people who can be impartial. I didn’t have that in my life before. I felt I could only confide my most important challenges to a small circle of people. And it’s important to note that the problems I had did not stop when I started seeing someone. The problems stopped when I started to stand up for myself and put in the necessary work on myself. Some parts of this journey have been a solo mission. But, however you choose to deal with what might be holding you back, your challenges need not constrict you. Life is full of paradox. As humans we’re able to feel both love and fear simultaneously. But that doesn’t mean we can’t choose one over the other. Which would you rather win out? And who will play the role of impartial judge to keep you honest with yourself? 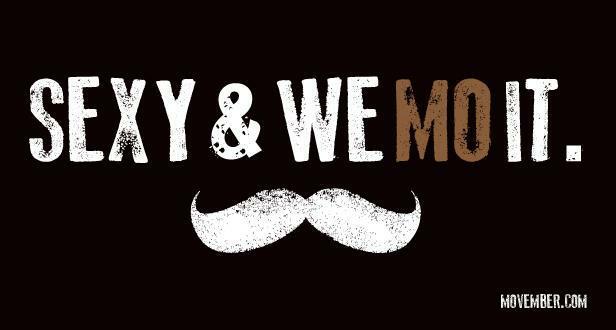 Today’s photo comes from the good folks at Movember. And as far as Movember goes, I would encourage you to explore this quick rundown of 5 reasons for the poor state of men’s health. There’s a lot to do with prostate cancer, testicular cancer, and cancer in general. But the oft-forgotten, stigmatized, and misunderstood dynamics of mental health are real. It’s a possibility that we may be dealing with it, just not able, or willing, to see it. Not everybody has a clinical condition. And it could happen – or be happening – to someone you love. Or someday even you. Be careful. And be kind to others – and yourself. This entry was posted in 60 Day Challenge and tagged accept, accommodate, confidence, confusing, courage, create space, depression, distractions, doubt, energy, focus, forgiveness, good intentions, impartial, kindness, love, love not fear, lovely dark and deep, mental illness, Movember, navigate through the noise, paradox, problems and solutions, realize, running, seeing someone, self-doubt, the greatest love of all, the present and future are bright, therapist, therapy, uncertainty, understanding. Bookmark the permalink. MCK — I enjoy reading your posts, and love the love you’re showing yourself. And yes, may we all remember to be kind to our selves and one another: life can be hard, no need to make it any harder. MCK – have read several of your posts, you are a great writer! Hope you continue doing this.